This little girl is waiting in Ghana. Please contact hislittlebeacons@yahoo.com for more information. Here is a brief introduction to adopting from Ghana. More info after the picture. Girl. Date of birth 18 August 1997. There is a $1300+ grant through From HIV to Home which will reimburse travel expenses for the adoption of this child. She is a delightful girl and is described as a “ray of sunshine”. 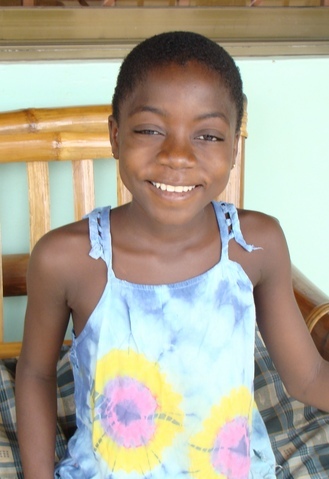 She arrived at the orphanage quite ill, but she is on medication now and she is doing very well. **Update – sadly, this girl took a turn for the worse in summer 2010. She was hearing voices in her head telling her to do things. Schizophrenia is suspected although it may be some other mental health disorder. Resources are limited in the area for an actual diagnosis. She needs a family that can help her get the medications she needs to thrive, preferably someone who is familiar with similar mental health issues. When she is healthy and not hearing voices, she is wonderful and helpful and a ray of sunshine. Fees are $6700 for a single child with special needs. (Includes all in-country fees. There are no agency fees. However, USCIS filing fees, fees related to homestudy and dossier preparation, as well as travel and accommodation, are not included). Time line for Ghana is typically 9-12 months from dossier submission.